Extravagant 3-disk set, including exclusive bonus disk! 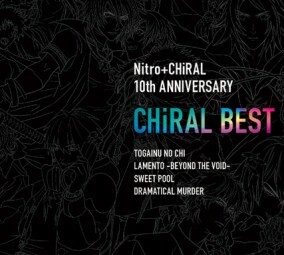 A compilation of the best vocal tracks, reflecting on the 10 year history of Nitroplus CHiRAL! Features everything from the hard-rock style opening theme "GRIND" from Nitroplus CHiRAL's revolutionary debut "TOGAINU NO CHI," to the opening theme "AI CATCH" for the groundbreaking Nitroplus CHiRAL work "DRAMAtical Murder" with music produced by GOATBED, this 25-track compilation includes all opening and ending themes for classic titles, and many more carefully selected by the Nitroplus CHiRAL staff. A few bonus tracks have also been recorded just for this album, including Japanese versions of "sweet pool" ending themes "Miracles may" and "the red road," and the PS Vita "DRAMAtical Murder re:code" opening theme song "RADICALMAT," which was never released on the soundtrack. This is an impressive 3-disk album you won't want to miss, featuring 10 years of Nitroplus history. 3 CD jewel cases in sleeve. ・No general release is currently planned for this product.